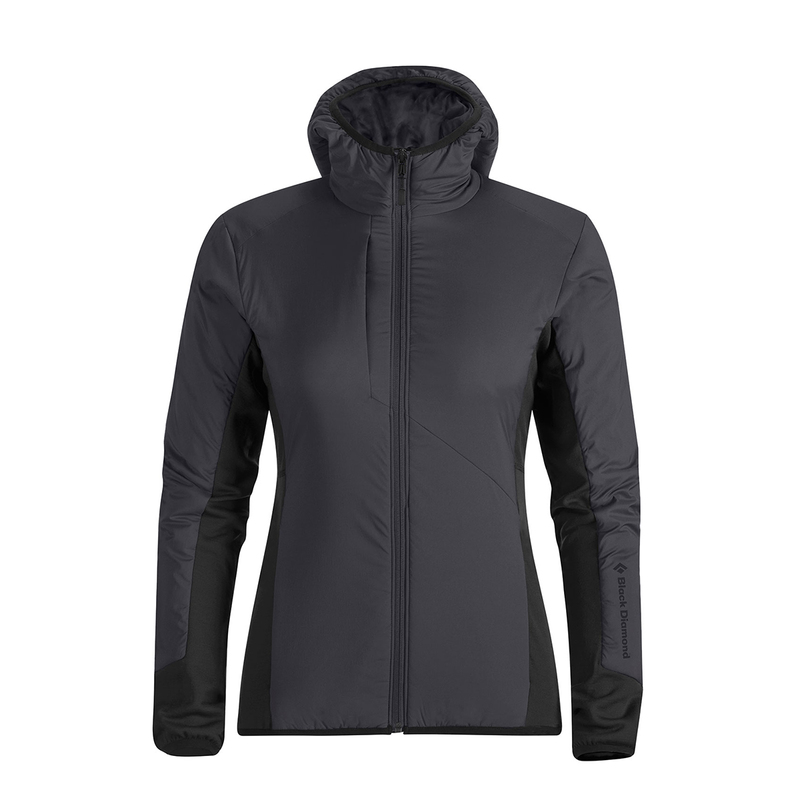 Made from a melange of top-quality fabrics with strategically placed insulation panels, the women's Deployment Hybrid Hoody is Black Diamond's premier mid-layer for ski touring. Designed to be worn all day during start-stop vertical climbs, it’s designed to provide optimal levels of both warmth and breathability. High exposure areas are insulated with Primaloft Silver Hi-Loft insulation, while the sheltered inner arms, back and side panels are made from a super-breathable merino wool and Nylon blend. Other features include a breathability-enhancing mesh liner and a low-profile hood, designed to fit under a helmet for the ultimate bad weather protection and extra warmth. MATERIALS Hood, chest and arms: Schoeller stretch-woven Nylon with Nanosphere technology (80g 93% Nylon, 7% elastane). Underdarms, back and cuffs: blended merino wool 300g 100% Nylon face with 100% merino back. Insualtion: 80g Primaloft Silver Hi-Loft. Schoeller is a Swiss fabric manufacturer best known for its high quality protective fabrics, which are used for everything from alpinism and snow sports to fighting fires. Black Diamond use Schoeller’s stretch woven soft-shell fabric because it’s optimally windproof, breathable and water resistant, making it ideal for aerobic alpine activities. It’s also stretchy and moves with your body, giving you a better range of movement than a shell might. Merino is a unique type of wool hailing from the merino sheep, and has been a landmark fabric for many a specialist brand. Merino fibres are smoother, softer and lighter than those of standard wooly-jumper wools, which makes them super thermally efficient. Merino fibers also have a natural crimp which means more air pockets for added warmth and breathability, and it’s naturally antibacterial, so it won’t stink after one afternoon on the mountain. Merino also contains Keratin, which is scientifically proven to be really good for your skin, making it one of the best base-layer and underwear materials around. It’s generally more expensive than the equivalent polyester, but is often worth the extra dollar. Primaloft Silver is a high-performance synthetic insulating material made from two different sized fibres, making it Primaloft’s loftiest insulator. Primaloft Silver Hi-Loft is lightweight and compressible, as well as super-warm and loftier than it parent fibre, Primaloft Silver. It maintains 84% of its warmth when it’s wet, making it one of the most effective insulating fibres in the world.